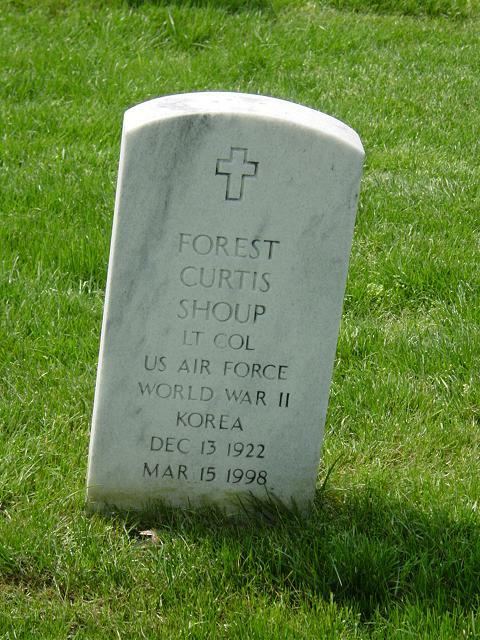 SARASOTA, Florida - Lieutenant Colonel Forest Curtis Shoup, 75, of 4708 Hidden River Road, and of Mercersburg, Pennsylvania, died Sunday, March 15, 1998, at Doctors Hospital of Sarasota. Born December 13, 1922, in New York City, N.Y., he was the son of the late Rev. William F. and Mildred King Shoup. He was a U.S. Army Air Corps veteran of World War II, flying B-24 bombers out of Italy in the European Theater of Operations. He participated in the Ploesti Raid in Romania and received the Distinguished Flying Cross and the Air Medal, among other military honors. In 1948, he participated in the Berlin Airlift and flew active duty during the Korean Conflict. He also joined the D.C. and Delaware National Guards and flew missions in Vietnam. He rose to the rank of lieutenant colonel before retiring from military service. After leaving active military duty, he was hired by Capital Airlines, which merged with United Airlines. In 1982, he retired as a 747 captain from United Airlines after 32 years of service as an airline pilot. He was past president of Chambersburg (Pa.) Saddle Club, a former member of Mercersburg American Legion, and a member of Sarasota American Legion, and the Masonic Lodge of Georgia. He is survived by his wife, Amelia Ann Smith Shoup; three daughters, Carlee Davies of Frederick, Md., Nancy Brown of Greencastle, Pa., and Elizabeth O'Connell of Hagerstown; two sisters, Lorraine Smith of Pinellas Park, Fla., and Edith Marsden of Mexico, N.Y.; one brother, Robert Shoup of Inwood, W.Va.; six grandchildren; and six great-grandchildren. He was preceded in death by one brother, William K. Shoup. Services will be held Friday at 11 a.m. at Harold M. Zimmerman and Son Funeral Home, 45 S. Carlisle St., Greencastle. Pastor Glen Miller will officiate. Burial will full military honors will be held Friday at 3 p.m. in Arlington National Cemetery, Arlington, Virginia, with the Rev. Wayne Powers officiating. Memorial donations may be made to the Awana Program of Calvary Bible Church, 3845 Buchanan Trail West, Greencastle, Pennsylvania 17225.